"This is my family's version of lion's head soup and for me it is the best type of comfort food! It is best served with white sticky rice, and wonderful enjoyed on a cold winter day." 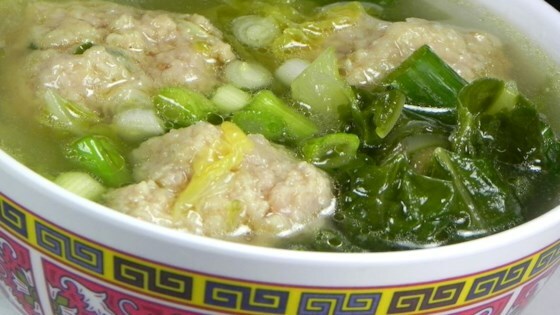 Mix the ground pork, egg, cornstarch, 2 teaspoons of sesame oil, ginger, monosodium glutamate, salt, and half of the chopped green onions together in a bowl. Use your hands to mix until the ingredients are evenly distributed. Set aside. See how to make delicious pork wontons in a simple broth. Wonderful! I just switched the pork for ground turkey, my little ones had second! Thank you for sharing that great recipe!